Plasminogen Deficiency (PLGD) is an ultra-rare genetic disease that can have devastating effects on multiple organ systems throughout the body. Ligneous Conjunctivitis (LC) is a sentinel manifestation of PLGD; approximately 80% of patients with PLGD have experienced LC. PLGD has most often being diagnosed in children and is associated with the abnormal accumulation or growth of fibrin-rich pseudomembranous lesions on mucous membranes such as the conjunctiva, gums, and linings of the airways and genitourinary tract. We learn more about this illness from Dr. Shira Robbins of the Shiley Eye Institute, University of California San Diego. 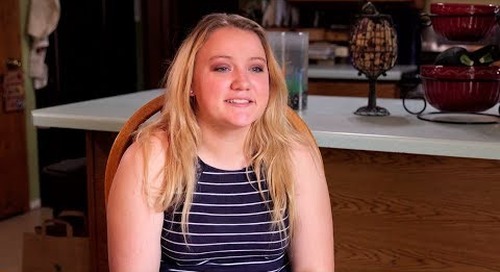 Sharing her very personal journey with PLGD is a young lady (Andrea) who’s been affected by plasminogen deficiency since birth. Also joining the discussion is her mother (Jessica) who has been a formidable PLGD advocate. Prometic is a biopharmaceutical corporation with globally recognized expertise in bioseparation and uses its own affinity technology for the development of best in class plasma-derived therapeutics and orphan drugs. Prometic’s plasminogen IV has shown a great promise for the treatment of both Ligneous Conjunctivitis and PLGD, and, has received orphan and fast track designations, as well as a rare pediatric disease designation from the FDA, with anticipated BLA approval in early 2018. Olga Villaverde: As we continue this special health edition of the Balancing Act we're going behind the mystery. Today, the ultra-rare disease known as congenital plasminogen deficiency. Now, while few are effected it has a profound impact on sufferers, their families and society. Put on the medical map 170 years ago it is only now that patients are seeing hope, new treatments are on the horizon. Joining me to talk about this systemic and potentially life threatening illness are Dr. Shira Robbins from Shiley Eye Institute, University of California San Diego and a young warrior Andrea who's affected by this disease almost since birth and her mother Jessica, a formidable plasminogen deficiency advocate. Good morning to all of you. Doctor let me start with you and i'm going to be completely honest- Plasminogen Deficiency, i had never heard of it, what is it? 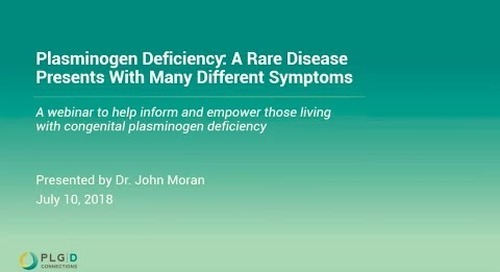 Dr. Shira: You are not alone there, plasminogen deficiency is a rare, potentially lethal and blinding disease and it happens because patients lack the enzyme called plasminogen and that enzyme is supposed to take away certain proteins. So, what happens is we get these protein build up throughout around our body which lays down in layers which form these thick membranes all throughout our body and in my work at the Shiley Eye Institute i like to explain things in terms of everybody life. So, if you were to take your front lawn and imagine that you never weeded or mowed again which i know you would never do. All of your healthy plants would end up getting choked and eventually die and that's what happens in this disease process. Olga Villaverde: That's a great analogy, thank you for that Doctor. Jessica, Andrea let me bring you in. Tell me about your journey with plasminogen deficiency, when did you notice that your daughter had it Jessica. Jessica: Well I've always kind of noticed since she was born, she always many bouts of what they have always thought was pink eye. So Andrea's been treated for pink eye, the normal regimen of what they would give for pink eye many times. It got to a point where it wasn't going away and we were referred finally to the children's hospital in Chicago after many visits back and forth between her pediatrician and ophthalmology misdiagnosed. She was finally diagnosed when she was about, almost 4. But even then we've done so many experimental treatments because there wasn't anything available at that time. Olga Villaverde: What a nightmare, Andrea i know you were quite young but do you have any recollection, do you remember? How did it affect you? Andrea: It affected me not as much as it affected my family but that's only because i was young and i didn't know much of what was going on. I just knew that there was something wrong. 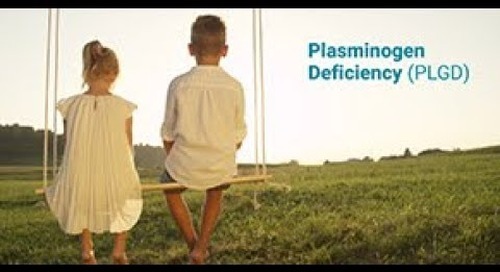 Olga Villaverde: Doctor is this typical of those affected with plasminogen deficiency? Dr. Shira: It Is, it's very typical having to go through many many doctors and often times many years and sometime's even having many surgeries before a proper diagnosis is made and it only takes a simple blood test. Olga Villaverde: A blood test? to get a diagnosis. Ok so let's kind of create some awareness today and what are the signs and symptoms to look out for here? Dr. Shira: Well the signs and symptoms are created by these membranes that i mentioned earlier and they can happen in multiple organ systems throughout the body. Usually where we have mucus membranes which are the wet portions of the inner sides of our body. So it happens in the eyes, these membranes occur on the inner sides of our eyelids and it can lead to scarring and even blindness. It leads to a lot of tearing, some pain and it really changes someone's appearance. It can take away hearing when it effects the ears, and in the mouth patients lose teeth and in the airways oftentimes patients have respiratory distress and they can even die from that. It can change the fluid channels inside of the brain into swelling of the brain, kidney failure, infertility, skin rashes and very poor wound healing so it really effects a lot of parts of the body. Olga Villaverde: So, if its effects a lot of parts of the body, we're talking about then probably you've gone to a pulmonologist, a rheumatologist an opthalmologist, specialist after specialist. Is that what you did? Jessica: Yes, yeah she see's many specialists, she goes to ENT, she has her opthalmologist, her pediatrician, her hematologist and ENT for ears, nose and throat. Olga Villaverde: And doctor, that is so trying. Dr. Shira: It does. It takes a team of doctors to not only diagnose but also treat it and it can occur usually in infancy, the beginning but it can occur first time in terms of symptoms at any time in their lifetime. Olga Villaverde: So, what treatment options are available today? Dr. Shira: Well, originally people saw these membranes and they wanted to peel them, both the doctors aswell as the parents but that really doesn't help. In fact, it can make it worse because when those membranes are peeled oftentimes they grow back very quickly and even thicker than before. So, there's been a host of treatments that have been tried and unfortunately none of them work great. It makes the most sense to try and replace what is deficient. So to replace the plasminogen in the first place. Right now, there is no current FDA approved plasminogen replacement therapy. But, there is one which is currently being reviewed by the FDA and so what that means is that all of the scientific analysis isn't complete but it's in the works. And Andrea's actually been a part of that, an important part of that- participating in that clinical trial. Olga Villaverde: And now that you have participated in that clinical trial how do you feel? Andrea: I'm feeling way better health wise and i mean physically and emotionally and mentally - just everything. It feels great. Olga Villaverde: And you look beautiful and you sound great, it makes me happy to know that. I know you're probably the happiest mum today to see her so much better but the road has not been easy has it? 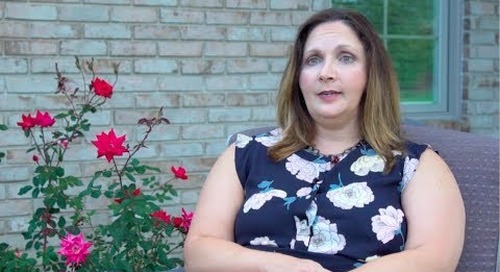 Jessica: No, Andrea had FM systems in class for her moderate hearing loss, she's had preferential seating in class because of her vision loss so she's felt kind of singled out her whole life. 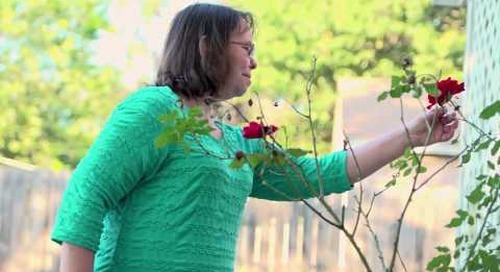 She was bullied a lot in elementary school because her eyes were crossed, because her brain had shut down her right eye. So. we've dealt with a lot of those things. Olga Villaverde: I know that you have a lot of hope and you are an advocate for Andrea and anyone with plasminogen deficiency. What resources are out there for people today if you could offer any? 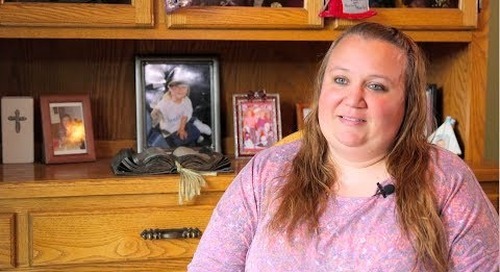 Jessica: The biggest resource that i have is a Facebook page that i created in desperation to find other people because when i first had Andrea diagnosed i had nobody and i was told that there was nobody. So, i created this Facebook page and people have found me. It's called 'Ligneous Conjunctivitis and Plasminogen Deficiency Support Group' and we all talk to each other, mums, caregivers, patients. 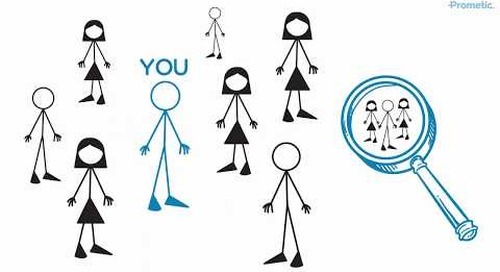 Create awareness, cry on each others shoulders, share our successes. 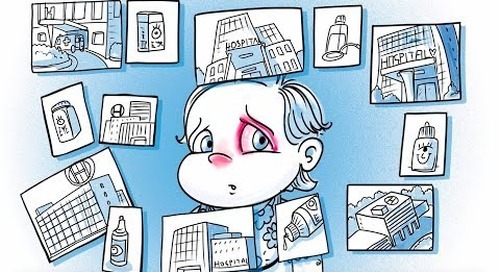 Olga Villaverde: Doctor, what advice would you give to someone out there who may be going through this right now or may have the symptoms and signs? Dr. Shira: Well, i think that it requires a strong and supportive family unit but i'm very hopeful for the future of these patients. We have great educational things happening like this show today. We have another very promising treatment right around the corner. So, i'm very hopeful in the future patients identified with this disease process will be able to do the simple things that we all take for granted like taking a deep breath, seeing your best friend, listening to your favorite music and maybe even becoming a parent. Olga Villaverde: Andrea, i want to end with you - any final words? Andrea: I just want other patients to understand that they need to have self confidence and they need to not care what other people think about them because, you are you and that's just everything.